Ray Padgett, creator of covermesongs.com, recently fashioned his passion for cover versions into book form. Cover Me: The Stories Behind The Greatest Cover Songs Of All Time came out earlier this month, and it examines everything from Jimi Hendrix’s version of “All Along The Watchtower” to Talking Heads’ “Take Me To The River” in grand detail. In this exclusive excerpt, Padgett goes deep on Weird Al Yankovic’s lesser-known endeavors—not the parodies, but the cover songs. As he continued his open-mic performances, Al began recording early song parodies on his tape player and gained local notoriety on Dr. Demento’s comedy-music radio show. Even once Al got a real band and regional fame in southern California (among a small group of comedy nerds), he kept the polka covers in his setlists. Soon, bongo-playing Joel was no more, replaced by Al’s longtime drummer Jon “Bermuda” Schwartz. In those early days, Al would throw random songs into his polka medleys, “local-interest kind of stuff, things that maybe people outside of L.A. wouldn’t know,” as Schwartz puts it. One early polka medley included tracks by Bad Brains, Suburban Lawns, and The Normal—not exactly “mass appeal” choices. The polka medleys remained a concert-only gag, though. When Al recorded his debut album in 1982, it blended original comedy songs with parodies of current artists like Joan Jett and the Knack. There were no polkas to be seen—though, as he points out today, the accordion was so prominent that every song sounded kind of like a polka. The polka covers transitioned from a live novelty to one of the most enduring components of his career when Al realized one thing: the medleys were funnier if you knew the original songs. The local-interest choices had to go. From now on, he would only polka-fy huge hits. Al first recorded a polka medley on his second album, 1984’s In 3-D. Gone were the obscure oddities from the live shows, The Plasmatics and Bad Brains, replaced by Clash and Talking Heads hits. The resulting song, “Polkas On 45,” kicks off with Devo’s “Jocko Homo” and rockets from there into Deep Purple, Berlin, and The Beatles. In the polka context, these disparate bands blend together into a zany accordion-fueled sprint. The more somber the original, the funnier to hear it goofed up (a chipper “In-A-Gadda-Da-Vida” is particularly inspired). The song choices often end up being hits he tried—and failed—to parody. On 2014’s Mandatory Fun, Daft Punk’s massive hit “Get Lucky” would have been one of the most obvious songs to parody. But all Al’s attempts failed, simply because the song has so few words. (“You need enough syllables to be able to actually make jokes,” he says.) So it ended up in the polka medley. Al could just sing over a basic polka beat—he could even use the same one for every polka—but he doesn’t. Al records a demo at home, then brings it into the studio with his band. They record the main band (drums, bass, banjo—as always, from scratch), the accordion, and Al’s vocals. But where most people would call that polka done, for Al that’s where the real work begins. When pressed, Al explains why he puts so much effort into the polkas’ goofy sound effects. Once recorded, there is one more hurdle to clear before a polka cover’s release, and it shows another way in which a parody and a cover song differ: legality. An artist doesn’t need anyone’s permission to cover a song; they just need to buy a license. With a parody, though, one needs neither permission nor any sort of license. A parody is considered satire and falls under a totally different law. Yankovic does get permission from the artists he parodies, but only because he wants to, not because he has to. When he is recording the polka covers, though, he, like anyone else, needs to get a license. In fact, he needs a bunch of licenses: one for each song he’s covering. “Polkas On 45” contained 13 songs, so he needed 13 licenses: from The Beatles, The Police, Devo, etc. Which brings up a particular quirk of cover-song copyright law. When you cover a song, you need to pay a set royalty rate—but the same rate applies even if you only cover part of that song. 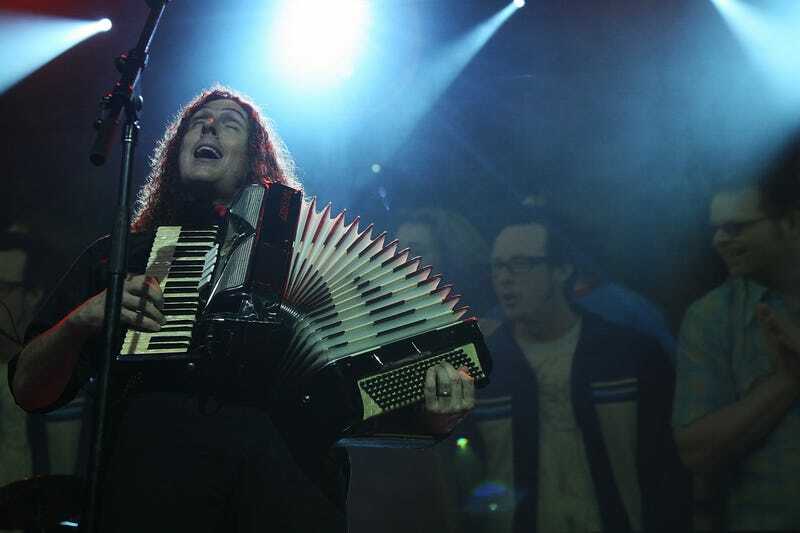 In Yankovic’s polka medleys, he is sometimes covering only five or ten seconds of a song, but the law doesn’t make that distinction. Which presented him and his label with a problem. Especially in the early days, the license fees would add up to more than his budget for the entire album. So he and his manager worked out a system. When Yankovic finishes recording a polka medley, they figure out exactly what percentage each song takes up, and negotiate with that song’s publisher to pay that percentage of the regular royalty. For instance, on that first polka, The Clash’s “Should I Stay Or Should I Go” takes up roughly 7 percent of the song. The Clash’s publisher would have to agree to take 7 percent of their usual fee. Instead of paying 13 royalties, Al would pay one royalty, split 13 ways. With this system, though, he loses one of the main protections copyright law offers cover songs. If you’re asking for something other than the standard mechanical license—like a discount—the publisher can say no. And occasionally they do. Yankovic once tried an all-U2 covers medley that died when the publisher wouldn’t agree to his royalty system. Weezer’s “Buddy Holly” had to be struck from a medley when the publisher demanded the full rate (they relented a decade later, letting Al polka “Beverly Hills”). Weird Al’s latest album Mandatory Fun, his first-ever No. 1, was the last album on his longtime contract with RCA Records. During interviews, he repeatedly claimed it might be his last album, period. He’s long complained that the traditional album cycle is ill-suited to parodies; they risk coming out after people have forgotten the originals. He may switch to just releasing singles in the future, putting out a new parody song as soon as he’s done with it. But without an album—and without a record company budget to license all these cover songs—is there a future for the polka medley? Will he perform a new medley in his upcoming no-parodies tour, perhaps? Al doesn’t know.